Week 37 Update – POLs begin! Hello Designers! Week 37 Update is below. 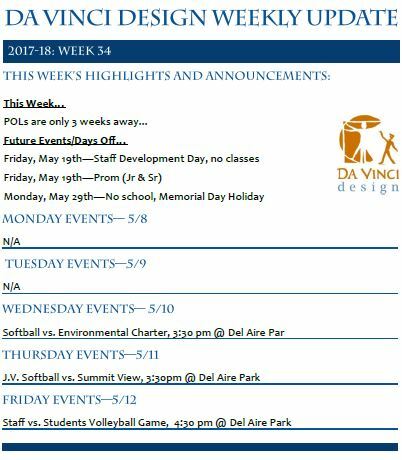 POLs begin this coming week – students are either scheduled to come in for the Morning or Afternoon session. Senior Checkout Cards will be available starting next week. The Da Vinci Design Class of 2017 would like to invite you to come and support their passion project with us on Thursday, May 25 at The Lakes in El Segundo. See more details below. We hope to see you there! 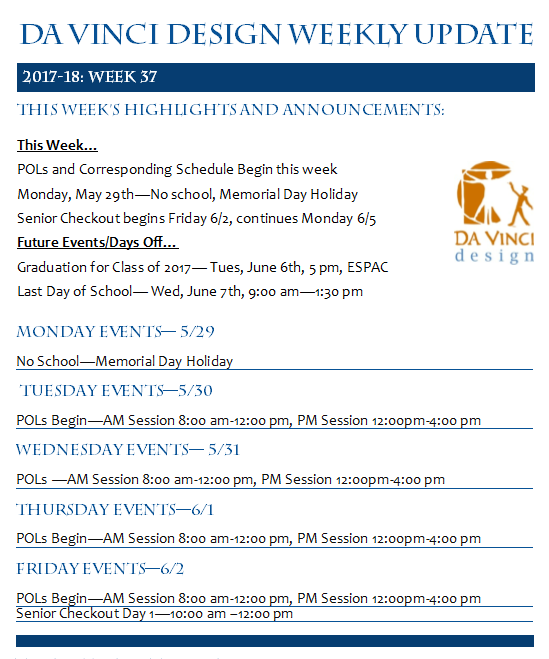 Designers, this is the last week of classes before POLs being on Tuesday, May 30th. 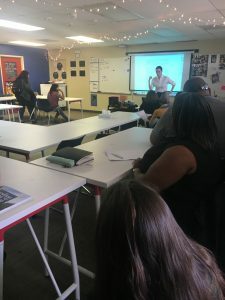 Take advantage of the time we provide you at the end of the day to work on your POLs, conference with and receive feedback from your teachers, and most importantly, practice! Senior Project Showcase is on Thursday 5/25 at Lawndale Community Center. Stay tuned for details! 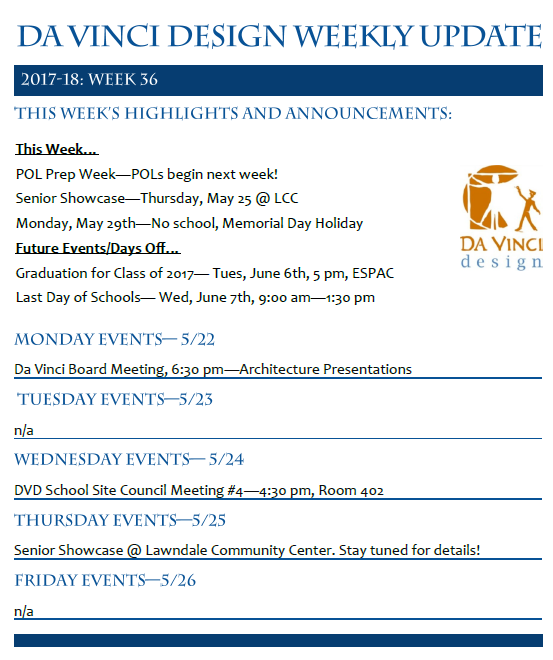 Select DVD students will be presenting their Architecture pathway projects to the Da Vinci Schools Board of Trustees on Monday evening. We are excited to see what they share and will provide an update afterward. 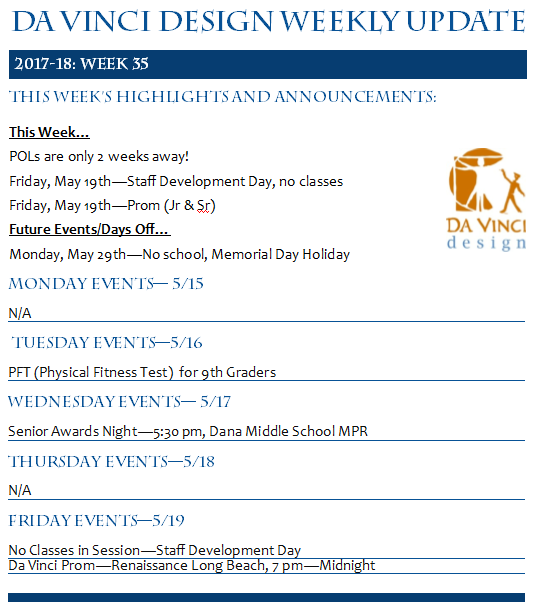 Below is the weekly update and bell schedule. We will see you tomorrow! Click on the links below to check out a couple of Summer Program opportunities! Remember, spend you Summer doing something you can put on your college application- be involved! See you counselor with any questions. Designers, below is your week 35 update. Have a wonderful weekend! Freshman will be participating in the PFT on Tuesday, May 16. Remember to come in appropriate active wear and bring a snack and water! Friday, May 19 at 7 pm at the Renaissance in Long Beach. Seniors & juniors are able to purchase tickets with Ms. Martinez in room 405. Want to go on an ATLAS trip or do service in LA? COME TO OUR NEXT ATLAS CLUB INFORMATION MEETING! Be one of the first ones there and get a free EF backpack! 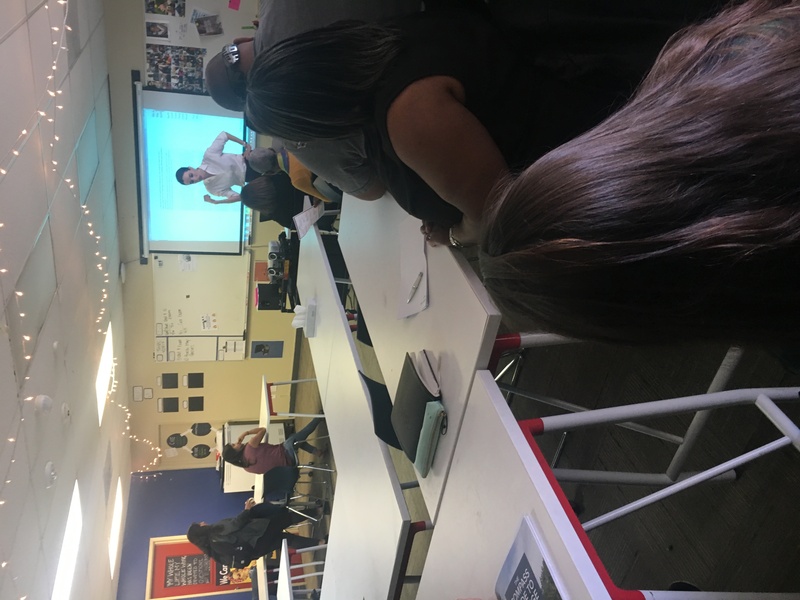 Thank you to all the parents and students who attended Da Vinci’s College Knowledge Night on April 27th. 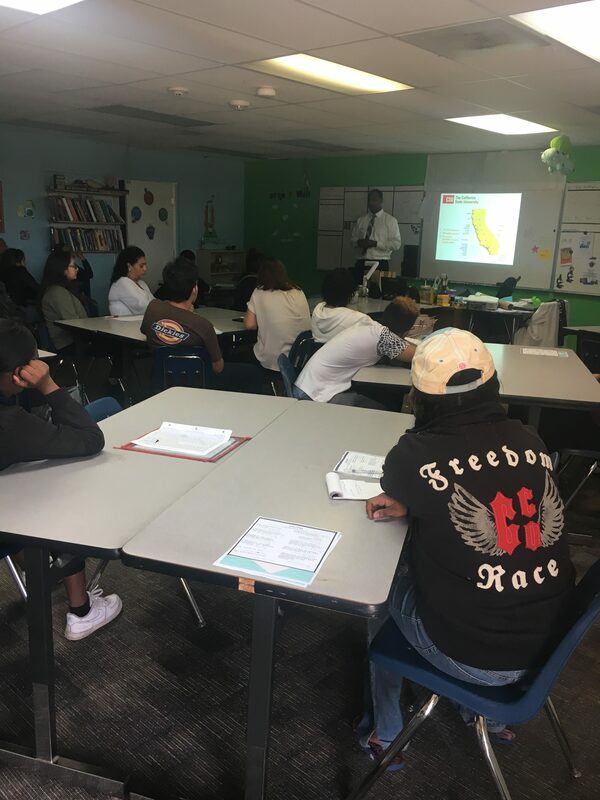 We hope Da Vinci families learned more about college applications, college types, and other information about finding the right college. We had a great turnout from families, colleges, and organizations. If you are interested in learning more about the Community College Pathway presentation, contact: outreach@wlac.edu. Thank you again to the families that came to the event! Designers – it’s that time of year again… Da Vinci’s Spring Musical! 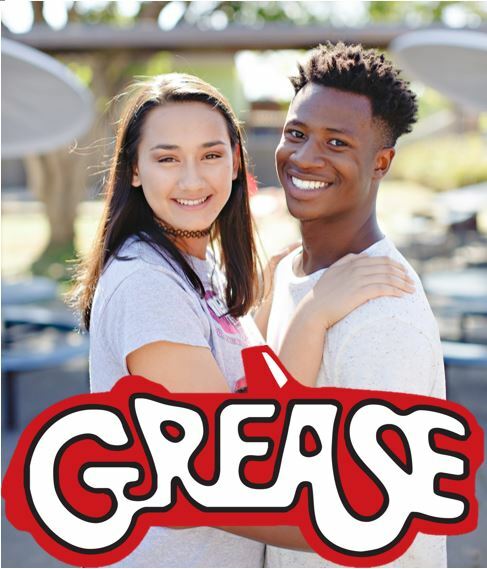 This year we’re going back in time to rock out in “Grease”! Performances will be on Thursday, May 11th at 5:30 PM and Friday, May 12th at 7:00 PM at the Forum at Da Vinci Science (13500 Aviation Blvd.). Tickets are $5 in advance and can be purchased at Da Vinci Design – Room 301 (Kalma) or $8 on the day of the show at the Forum. Get ready to toe-tap, hand-jive, & a wop bam boom! We hope to see you there. 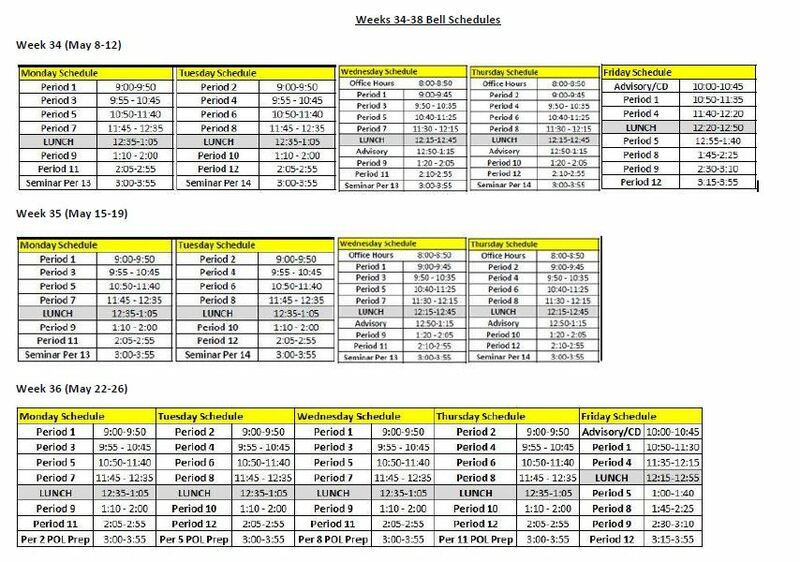 Families, we wanted to share the bell schedules for the remainder of the year as to avoid any confusion in the last weeks. Your student should be receiving their POL session assignment from teachers within the next week or two. DVD families, we are so grateful for all who appreciated teachers this week. Whether you donated a yummy treat or sent a note of appreciation, it truly brightened our staff’s week! We are thankful to have a such a wonderful school community. Below is your week 34 update. It’s hard to believe, but we only have 3 weeks until POLs begin and 5 weeks until school is out for summer! Have a wonderful weekend.